From Wednesday 6 to Friday 8 February 2019 the Dutch Ministry of Agriculture, Nature and Food Quality and the Province of Fryslân invite you to the congress ‘‘CAP strategic plans – exploring Eco-Climate schemes’. During this congress we will explore how to design a flexible targeted territorial approach which could lead to cost reduction and efficiency and substantial gains for the climate and the environment. This congress is a networking opportunity for decision-makers from agricultural ministries in the EU member states and other relevant stakeholders. The congress takes place in the city of Leeuwarden, the 2018 European Capital of Culture. The programme consist of speakers, excursions and workshops. You can download the complete programme (pdf, 80KB) by clicking the downloadbutton below. The conference language will be in English. Travel and hotel costs are borne by the participants; congress costs, including field visits, lunches and dinners, are borne by the organizers. Do you have any questions, then also see practical information for more information and contact details. The Dutch Ministry of Agriculture, Nature and Food Quality and the Province of Fryslân look forward to seeing you ! We have compiled a varied programme for which, along with the content, there is a great deal of room for networking, exchange and interaction. During this congress we will explore how the national CAP Strategic Plans can be implemented both flexibly and cost-effectively. International speakers and workshops will highlight the combination of Pillar I and Pillar II measures. The Agri-Environment and Climate Measures implemented by farmers’ partnerships, such as those carried out in the Netherlands since 2016, serve as inspiration during field visits. How to write a National Strategic Plan? The Netherlands, and in particular the Northern province of Fryslân is leading in the area of sustainable agriculture and CAP Strategic Plans. We want to share this knowledge with our colleagues in Europe. That is why the Dutch Ministry of Agriculture, Nature and Food Quality and the Province of Fryslân invite you to explore how to design a flexible targeted territorial approach which could lead to cost reduction and efficiency and substantial gains for the climate and the environment. The world population is growing, consumers are becoming more and more critical about their food. The climate, the environment and the landscape are under pressure and discussion. Together, we have a large responsibility for the future of agriculture and our living environment. The challenge is: how can we design a green architecture within the Common Agricultural Policy (CAP), making use of both area-based and result-based measures in the first and second pillar of the CAP? The discussions about shaping the CAP after 2020 are in full swing. Eco-schemes and Enhanced conditionality in Pillar I and Climate and Environmental measures in Pillar II. Member states have some flexibility to decide which instruments are prioritized. Should these measures be mandatory? How to design result-based measures? How to make the national CAP Strategic Plan robust and flexible with low administrative and implementation costs? The national plans also have to be effective to meet the climatic and environmental ambitions of the CAP. The plans have to be accepted by farmers, other landowners, NGOs and various governmental organizations. Furthermore, countries and regions differ. When designing a green architecture, there is no ‘one size fits all’. How can Member States share experiences in designing an architecture that fits our specific needs? The city of Leeuwarden is 150 kilometres from Schiphol Airport. There are various ways to travel to Leeuwarden. There is a special bus from Brussel to Leeuwarden and Leeuwarden to Brussel. 09.00-09.30: loading luggage and check out hotel WTC. The bus stands in front of the hotel for loading the luggage. You will not be back in the hotel. Departure bus direction Brussels 21.15 hours from dinner location at Blokhuispoort. Arrival Brussels 00.30 hours. You can travel from Schiphol Airport to Leeuwarden by train in approximately 2.5 hours. From the Leeuwarden train station you can take a taxi to your hotel, a journey of approximately 10 minutes. Leeuwarden is approximately 1.5 hours by taxi from Schiphol. You can take a taxi to Leeuwarden from Schiphol Airport. 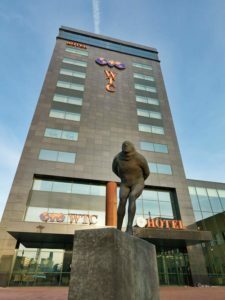 We have made a reservation for you at the Westcord WTC hotel in Leeuwarden. So you do not have to a make a reservation at the hotel. The Comfort room is € 119.00 per night, including breakfast and excluding a city tax of € 1.00 per night. If you use the room for two persons then there is a double- room charge of € 16.50 per night. The Westcord WTC hotel is approximately 15 minutes walking distance from the town centre. Free parking in the parking areas B2 and B3 next to the hotel. From Wednesday 6 to Friday 8 February 2019 the Dutch Ministry of Agriculture, Nature and Food Quality and the Province of Fryslân invite you to the congress ‘Let’s design the future of agriculture’. Travel and hotel costs are borne by the participants; congress costs, including field visits, lunches and dinners, are borne by the organizers. If you have any questions, then please get in touch with the organization via info@capcongress.com. Please note: Registration for the conference has been closed because we have reached the maximum number of registrations for the event. Thank you for your interest.